We awoke to another hazy day. It seems that when we don’t have haze, we have rain. Nonetheless, it was another good day. 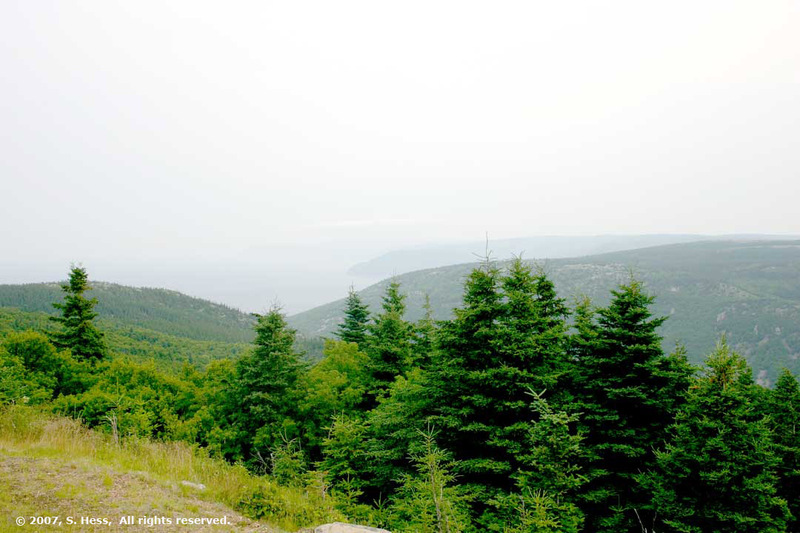 This morning we headed out on the Cabot Trail… this time to the north. 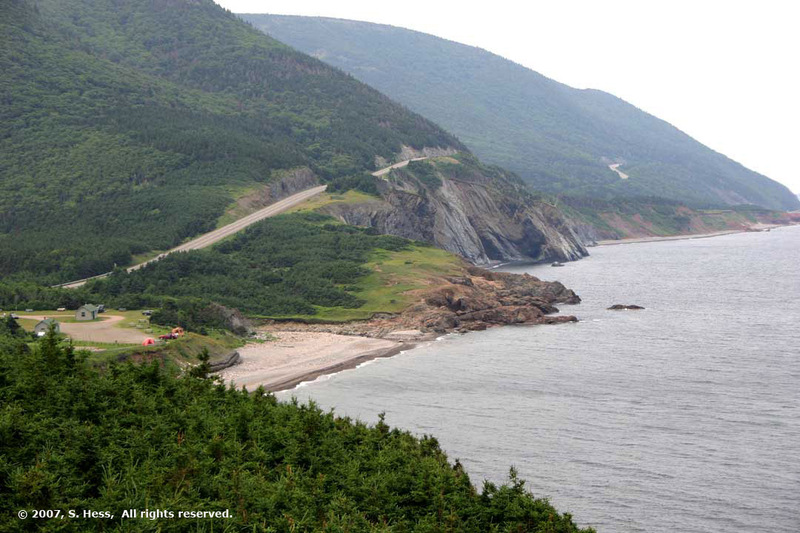 Our intent was to drive to the town of Cape North and then take a local road to Bay St. Lawrence and Meat Cove. 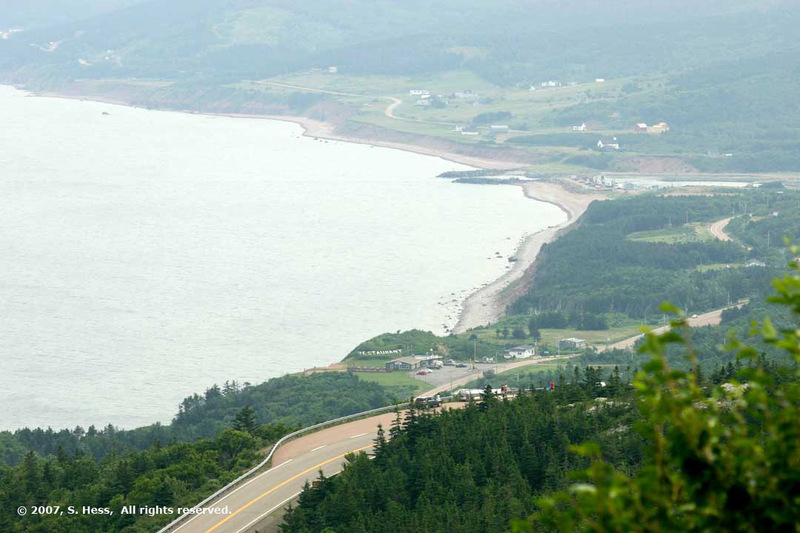 We figured we could hit the eastern part of the Cabot Trail, in part tomorrow morning while driving to New Harris (North Sydney) and during one of the days we have at the next stop. 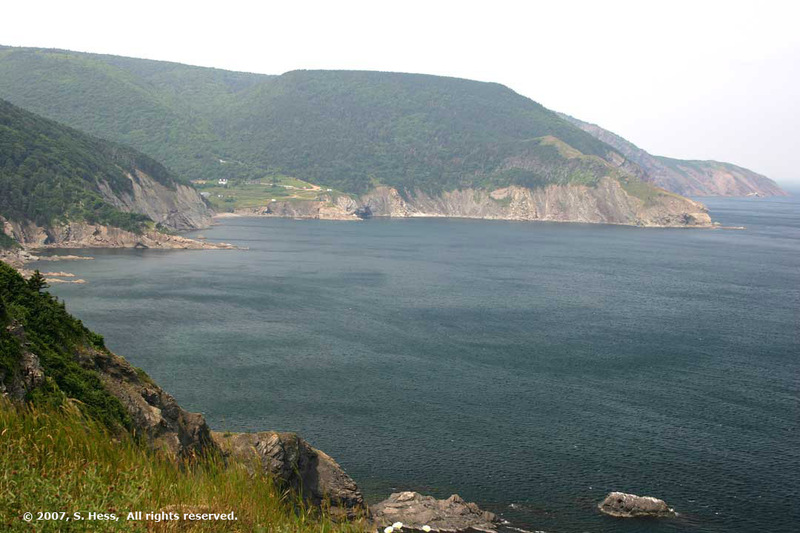 Just north of Cheticamp is the entrance to the Cape Breton Highlands National Park. Almost as soon as you get into the park, the road starts the first of many climbs that we would do today. 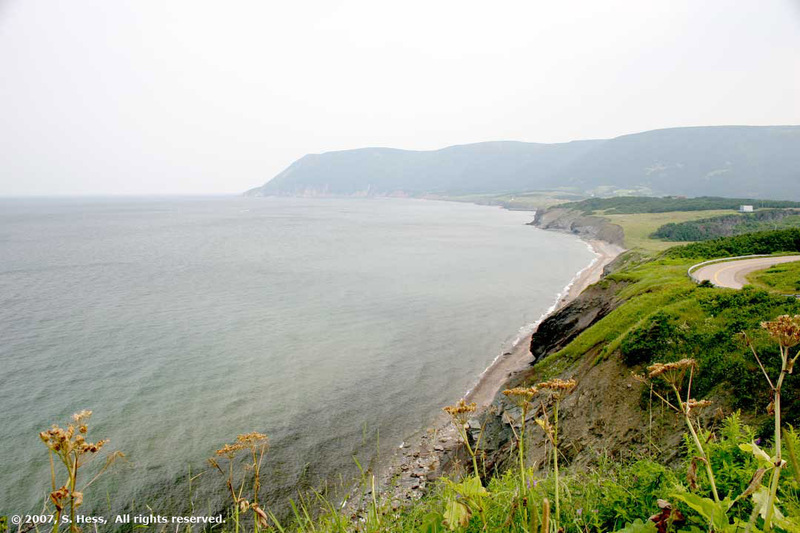 The first 15 miles of the road follows the hills overlooking the Gulf of St. Lawrence. 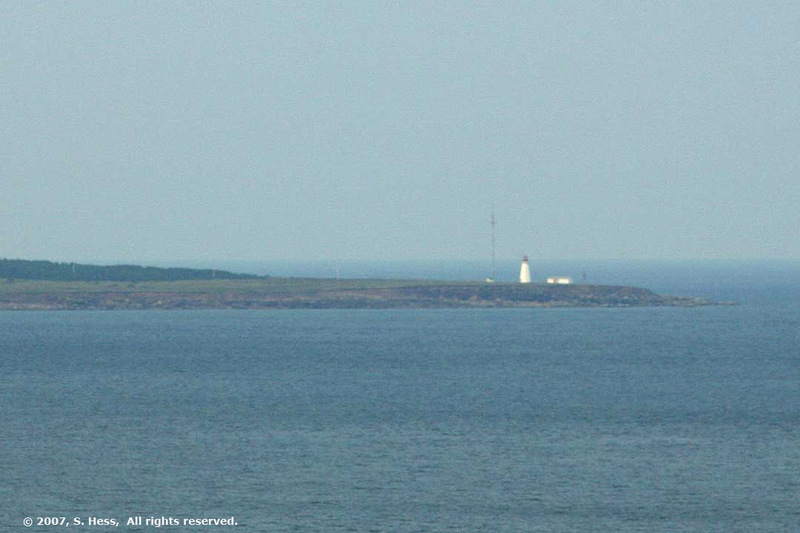 We paused at a number of lookouts to view Cheticamp and the area of coast that we were on during yesterday’s whale watching tour. The Trail turns inland and climbs onto the Highlands Plateau. 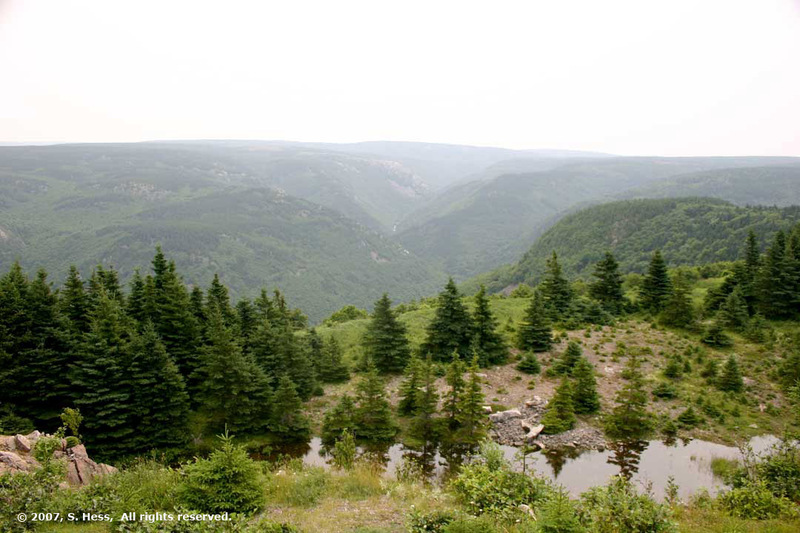 The plateau stretches across the northern tip of Cape Breton Island and reaches a maximum height of about 1750 feet. 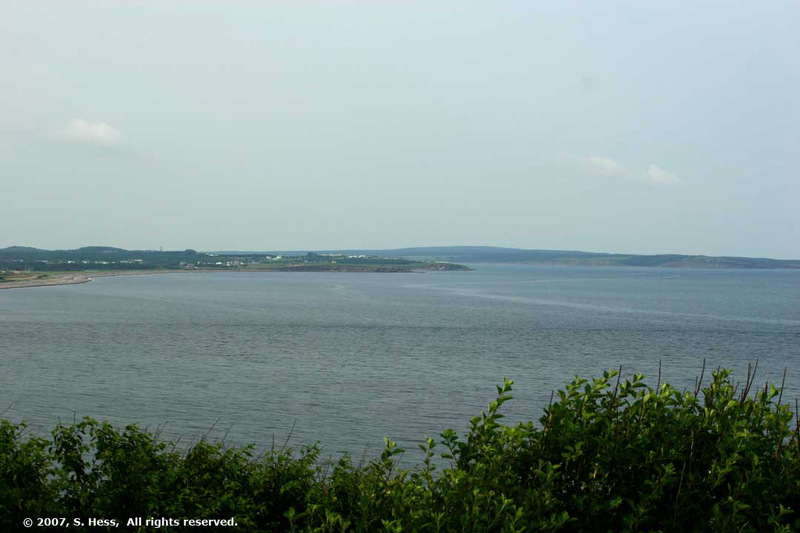 The road turns to the coast and drops down into Pleasant Bay, a popular whale watching location. It climbs back up (and down) through the hills and turns to the east until it reaches the town of North Cape, where it starts its way south. 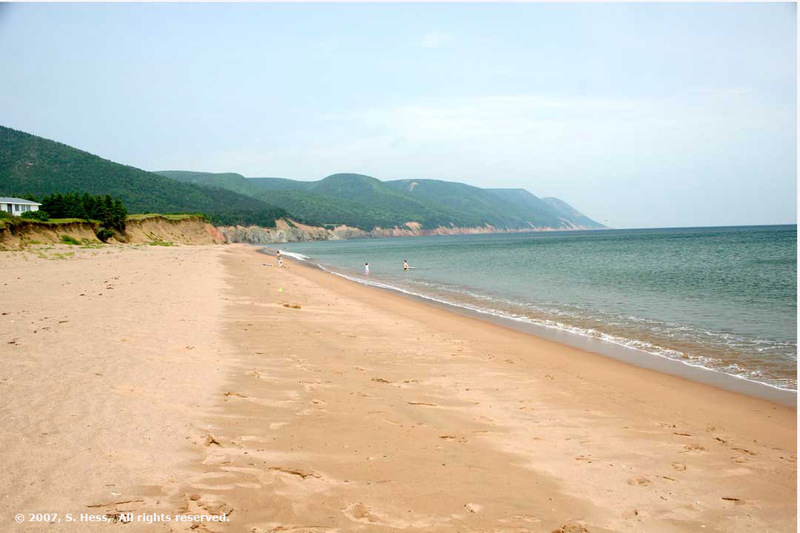 We turned off the Cabot Trail at the town of Cape North and headed north towards twin capes of Cape North and Cape St. Lawrence on the northern tip of Cape Breton Island. This route is lightly traveled by tourists although we did cross paths with a number of cars bearing “foreign” license plates. The town of Bay St. Lawrence is one of the prettiest fishing villages we encountered in Nova Scotia (Peggy’s Cove is still number one to us). 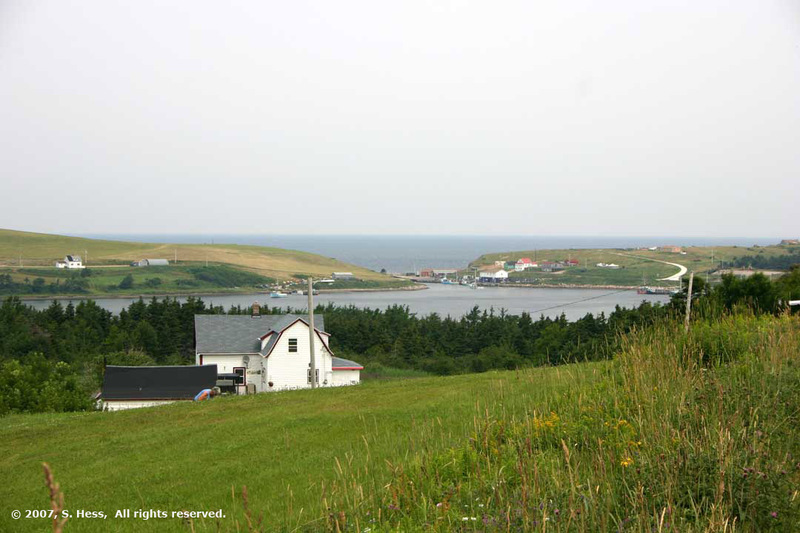 From Bay St. Lawrence, we drove along the north coast, largely on a gravel road until we reached the settlement of Meat Cove, where the road ends in a campground. 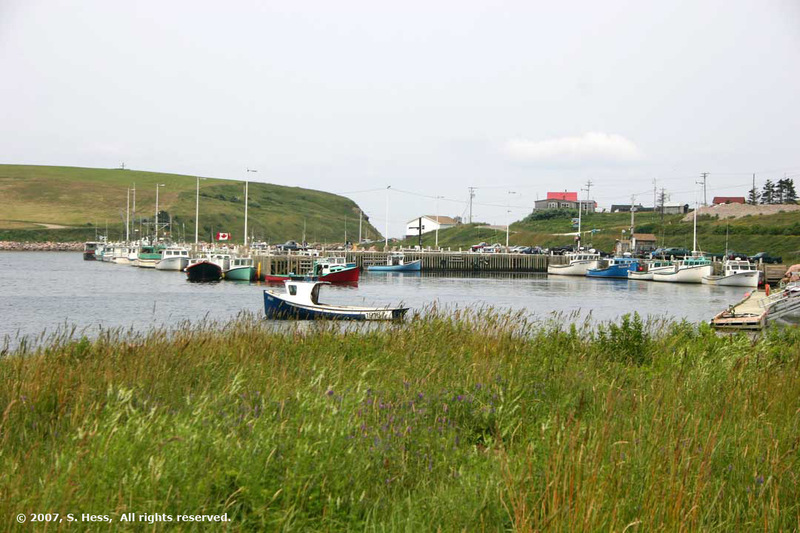 Meat Cove is not much of a town but is considered the northernmost settlement in Nova Scotia. Having no further to go by road then Meat Cove, we turned back towards the town of Cape North. At the community of Sugar Loaf, we stopped at a picnic area that is on the spot where the explorer, John Cabot, landed on the North American Continent, in 1497. 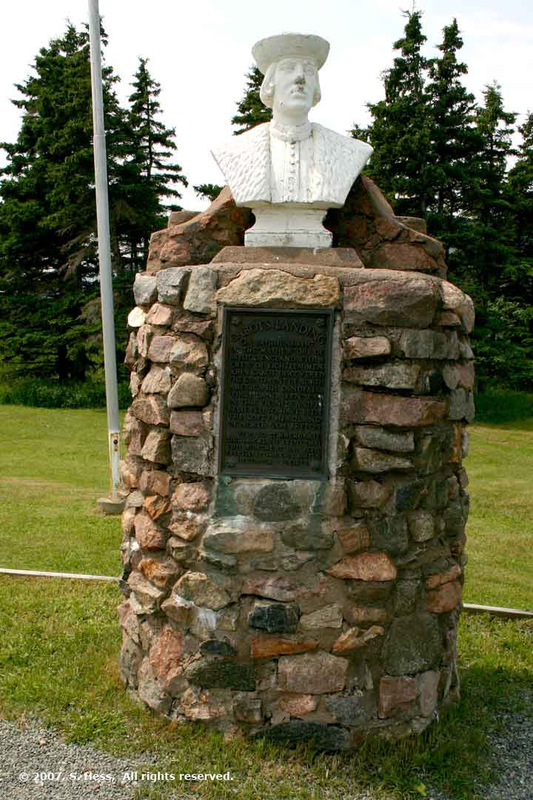 The plaque at the monument in the picnic area says that Cabot (real name Giovanni Caboto, an Italian working for King Henry VII of England) discovered North America. The logic behind this claim is that Columbus never landed in North America. This was one of the nicest picnic spots we had seen on this trip. We sat at the table with a view of a beach that stretched before us for miles and of Cape North, a few miles to the west. After lunch, we retraced our steps back to Cheticamp. On the way back we spotted a couple of moose cows on the side of the road. Getting safely off the road to get a picture of one of them allowed her enough time to shows us the end of her we didn’t really want to publish on this site. 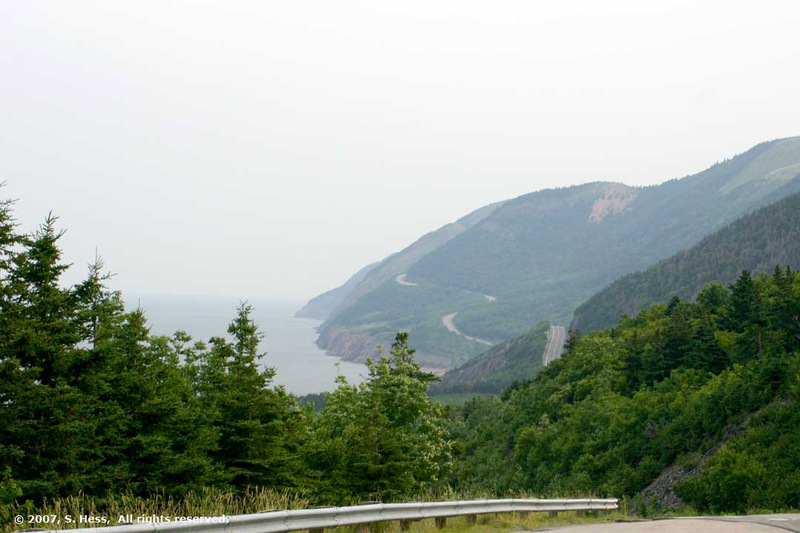 The ride to Cape North convinced us that we should not take the Cabot Trail with the trailer in tow. The Northern portion of the trail has some serious grades and numerous switchbacks. While the truck and trailer can handle the route, what is the point when the southern portion is so much easier? At any rate, we would have difficulty pulling over in many of the lookouts. Internet access has been a problem for most of our time in Nova Scotia. We have not had any Internet service for the past three days and it is not available at our next stop, so the next three days pages may be delayed as well. We hope to find a public Internet access point, such as a library, museum or some other public building, where we can upload the last few days' pages. Yesterday's whale watching tour was off this bay.